I started working in content marketing nearly (ahem) 10 years ago. Admittedly, I had no clue what the hell I was doing. I had just graduated from college with a degree in journalism and knew I liked to write. I was running a tiny online magazine (mostly for fun, certainly not for profit). So, it seemed like an obvious fit that I would get into content marketing. After all, I would write and publish stuff but just get paid more to do it. Of course, I learned that wasn’t the case. Content marketing isn’t the same as publishing for most companies because it’s driven by different forces and done for different reasons. Most publishers care only about eyeballs–pageviews–which is rightfully considered a vanity metric by most business standards. But, over the years, I’ve spent a lot of time studying and thinking about content works at a strategic level and what tactical steps go into making that strategy viable. I’ve looked at content from various business angles and channels–search, social, email, etc–and thought about how content becomes a driving component in a broader strategy that helps grow a business. In order for your content to matter, it needs to be created with intention that’s linked to something bigger than just spilling words on the page. It’s got to be driven by strategy and fit within a framework for how you can use content to create real value for a business. Content for the sake of content is not a strategy. Blog and pray is not a strategy. Get the full list of strategies, tactics, and tools you need to plan and execute a successful content marketing strategy. I’ve compiled these 7 frameworks as a way to think about content marketing from both a strategic and tactical perspective. At a high level, you’ll see how the different aspects work together to drive specific goals. But, in the detail, you’ll see how individual parts move together to achieve those ends. This is certainly not a comprehensive playbook of every imaginable content marketing strategy. But it covers most of the common scenarios, business challenges, and goals that we see when talking with clients and potential clients. And almost every scenario is covered when you include each of the variations that you can create by combining one or more of these frameworks to accomplish specific, stated goals. For free consumer apps, free trial offers, and other light-touch acquisition models, you can use content to qualify prospects and improve brand awareness. Then, follow up with those users with a direct response offer through email or by retargeting. This kind of warm acquisition will help you familiarize your audience with your brand before you make a direct response offer. 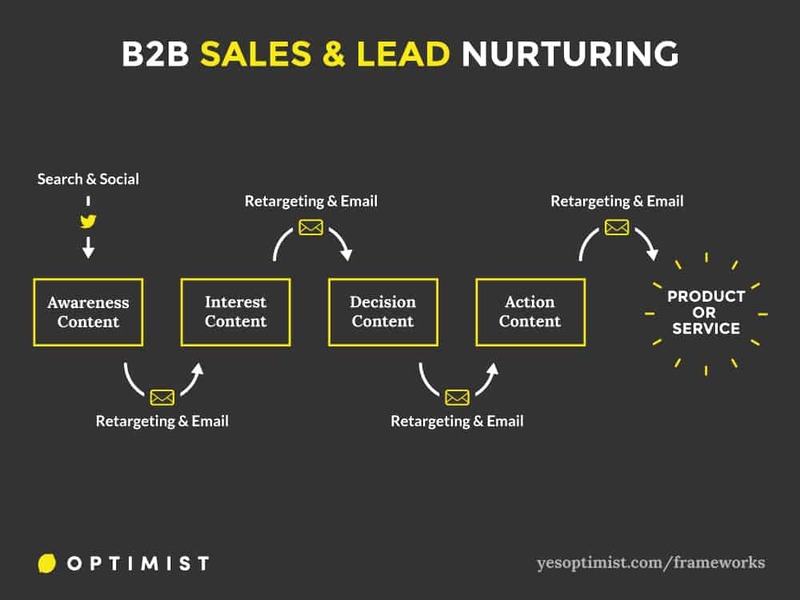 But this framework is more simplified than a robust lead nurturing strategy that you’ll need for bigger purchases or traditional B2B sales. This model essentially works as a two-part touch process. All you need is some content that drives traffic and engagement, filling the top of your funnel. Then you can use retargeting to continue to reach that audience and keep pushing them to take the next step. Keep in mind that this will only work for simple user acquisition models — free or cheap SaaS products, etc. If you have a big-dollar item or a service product, you’ll likely need many more touches to turn a cold lead into a real prospect. 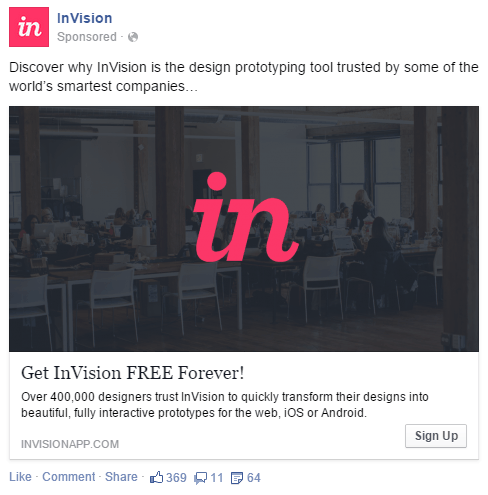 InVision has grown a truly massive following for their incredible content aimed at designers, product teams, and entrepreneurs. And they’ve leveraged that content–and all of the traffic it generates–to fuel growth in a way that really matters to their bottom line. If you peruse any of their fantastic articles and then find yourself browsing Facebook, you will almost certainly see an ad for their product offering–a direct-response ad encouraging you to sign up. This is warm acquisition for a digital product. They know that you have been on their site and have some familiarity with their brand. This means that you’re more likely to respond to an ad or click a call to action. For InVision, this likely reduces their CPA on user registrations considerably compared to cold audiences. 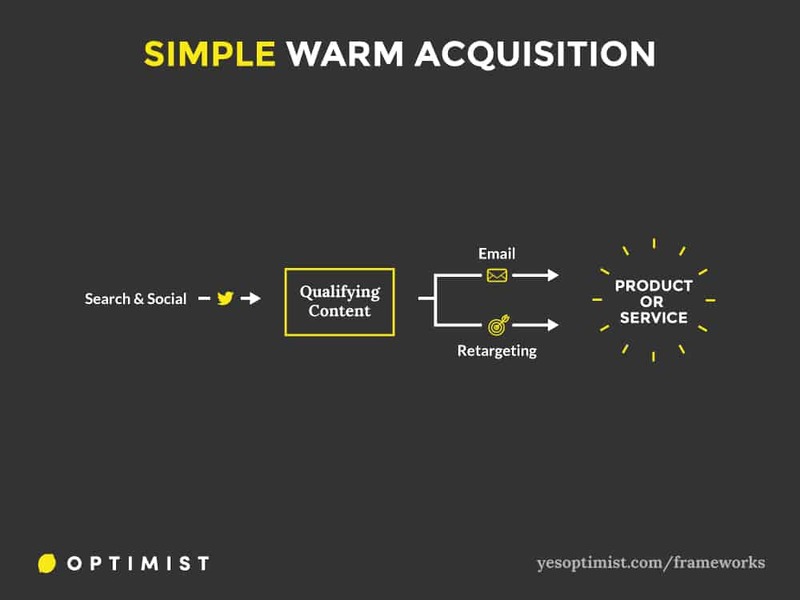 For a bigger product sale or lead generation strategy, you’ll need to make more touches with a prospective customer than a simple warm acquisition model. This applies to things like large product sales, B2B services, consulting, etc. You can use a similar mechanism to the one used in the warm lead acquisition model, but build a longer content and retargeting funnel that helps you continuously engage the user as they go from stranger to customer. Rather than going from content directly to offer, you’ll use content to qualify a prospect and move them from the awareness stage toward taking action. The mechanics of this framework are a bit more complex than the first example. But, once you get things configured, you have essentially an automated nurturing system that takes cold prospects (read: strangers) and gradually moves them toward taking action. So, for example, you target the audience of people who have already visited the “awareness” content (excluding all of the other audiences) with your “interest” content. Then, you target the people who have viewed the “interest” content with your “decision” pieces. This runs as a continuous cycle, moving prospects through the sales process and toward the ultimate purchase. This strategy is nice because it can be used in a way similar to complex marketing automation workflows, but in a simpler (and cheaper) way. 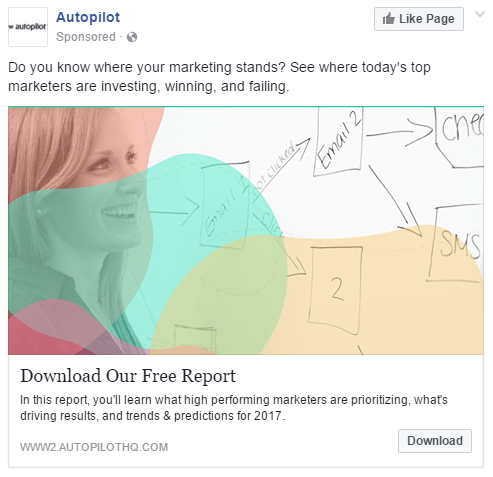 Autopilot is a marketing automation tool. And part of their own marketing strategy is to use paid media to drive me (as a prospect) toward using their product. Once I visit their site or read their content, rather than pushing for a sale or a signup, Autopilot uses smart targeting and segmentation to move me through the customer journey, offering me relevant content at each stage. This kind of ultra-precise targeting and content delivery was not really an option before the digital age of retargeting and social ads. But, now, it’s a proven strategy for lead nurturing and sales development. Many successful ecommerce websites drive most of their sales from organic search traffic landing on product or category pages. These are high-intent searches and they are more likely to convert than someone seeing an ad or coming in from a blog post. So, if you run an ecommerce website then you should be primarily concerned with organic visibility of your product and category pages. But, it’s not easy to build links to these pages. This strategy addresses this issue by using domain authority to drive increased visibility even if you have no links to your product or category pages. It’s similar to how Amazon ranks well for almost all of their products, even if that particular product page doesn’t have any links pointing to it. This strategy works primarily by focusing on creating content that generates links back to the domain. This raises the overall domain authority, leading to higher search rankings for all of the pages on the website, including the all-important product and category pages. An approach like this works because search engines do not just look at how many links point to a single page. Instead, they look holistically at the authority of your entire website. So, links pointing to your blog (assuming it’s on the same domain) still pass some value to the other pages on your website. You can also use internal linking and other strategies to help bolster this effect. Beardbrand has quickly grown into a dominant player in the men’s facial hair and grooming space. And a large part of that success has come from their SEO game. They’re top of the results for nearly any relevant product category or type. So, how do they rank so well for these huge keywords? In large part, because they’ve built a healthy link profile back to their website, which has given them a lot of focused authority within their market and around “beard” searches in general. 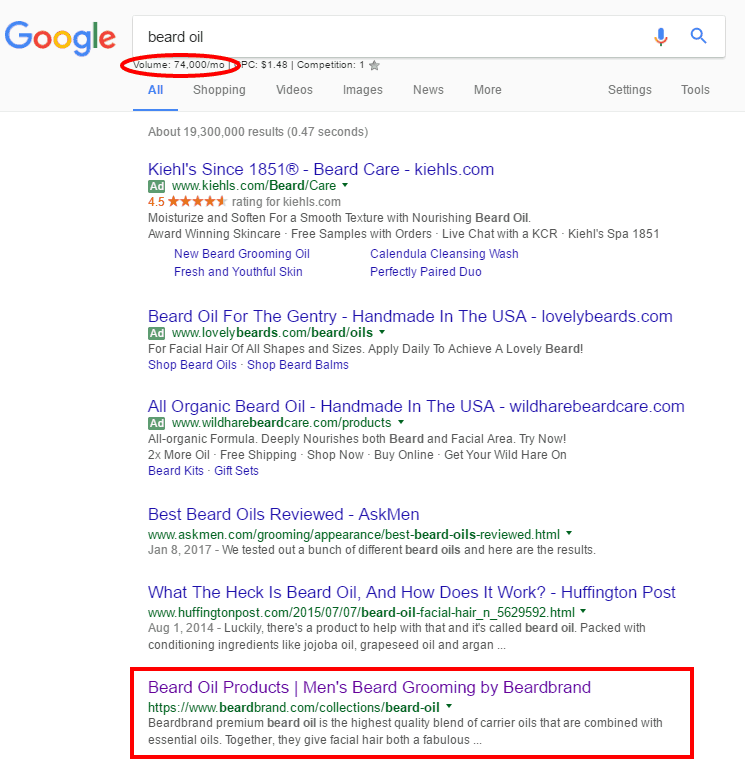 Admittedly, Beardbrand’s authority has come on the back of links generated mostly through great PR rather than a traditional content marketing strategy. But the same principles apply either way. As the domain rises in authority, the visibility of all of the pages–including product and category pages–also increases. Many websites want to cast a wide net of content to capture their audience at different stages in their buying decision. They may not be concerned with traffic to any particular page, but rather the total volume of relevant, targeted traffic they can generate and the percent of those visitors they are able to convert. I call this the “evergreen forest” because it’s built on a huge number of evergreen articles that are propped up by the website’s overall domain authority. With this approach, you’ll focus on letting organic search do most of the heavy lifting and bring traffic to your site. The upside is that you won’t have to spend money on driving short-term traffic and you’ll be investing in a long-term asset. The bad news is that you won’t start generating results for some time. It will take a while for Google to index your site, and your website’s authority will grow slowly over time, meaning your content will work its way up from #99 on Google up to #4. This doesn’t happen quickly. Many sites create evergreen content–aligned with specific searches that are relevant to the target market. But they often forget that evergreen content on its own doesn’t work. You need to raise the authority of your domain in order to increase the visibility of your evergreen content. 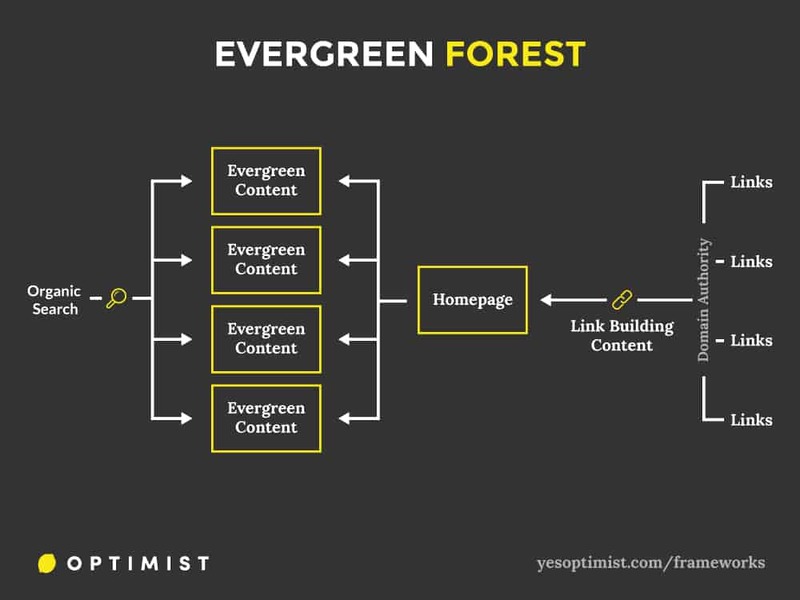 So, with this strategy, you use link-building content to grow the authority to your domain and then pass that authority on to your evergreen content. 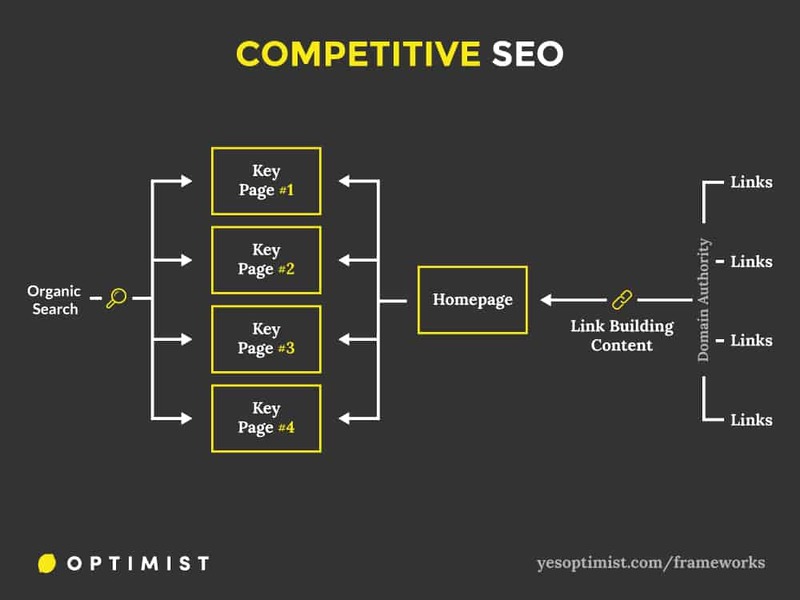 Over time, you begin to see compounding growth as you publish more content optimized for more keywords and each content piece is ranking higher in search. We all know WebMD as the number one website to visit if you absolutely need to be convinced that you have cancer. But, have you ever considered how they became so massive? WebMD generates millions and millions and pageviews each day with a massive library of keyword-focused, evergreen content paired with a healthy domain link profile. That’s a shi*t-load of traffic. Their enormous library of content has played no small part in their success. If you Google nearly anything related to your health, they’re sure to be near the top of the results. And since their website has been around for a long time and generated a huge number of backlinks, even the content on their site that has few links is generally near the top just on the strength of the domain. This also means that when people are looking for information to reference, they are likely to find a page on WebMD, which means that they earn even more links. Some businesses are primarily interested in generating search visibility for their homepage or key product pages that drive purchases, signups, or whatever matters to their bottom line. What you ultimately need is to bring in links to your website, which will help you compete against other, more established websites. Just like in the other examples, increasing your overall domain authority will help you rise in the SERPs for your target keywords and gain relevance and traffic. 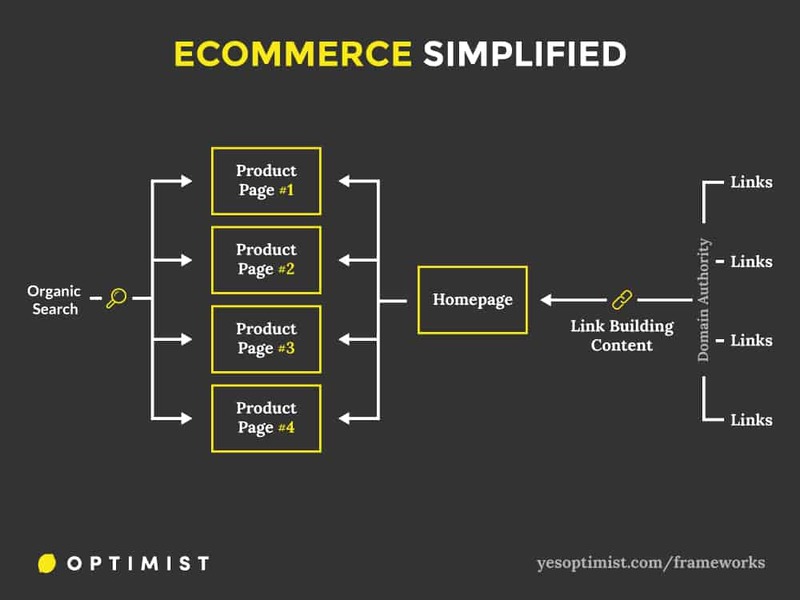 Much like the ecommerce strategy, your primary goal with this approach is to bring in links to your content and then pass the authority from those links to your homepage. This means that your content marketing strategy is, essentially, to focus on building links. You should create “linkable assets”–like infographics, guides, and other content that can be used to attract links–that will help you raise your domain authority and raise your ranking for the competitive keywords you’re targeting. Links directly to the homepage are also relevant, but it’s often easier to generate links with relevant, interesting, link-worthy content than it is just to the homepage. Slidebean has an online presentation software that’s great for startups and others putting together interactive pitch decks. 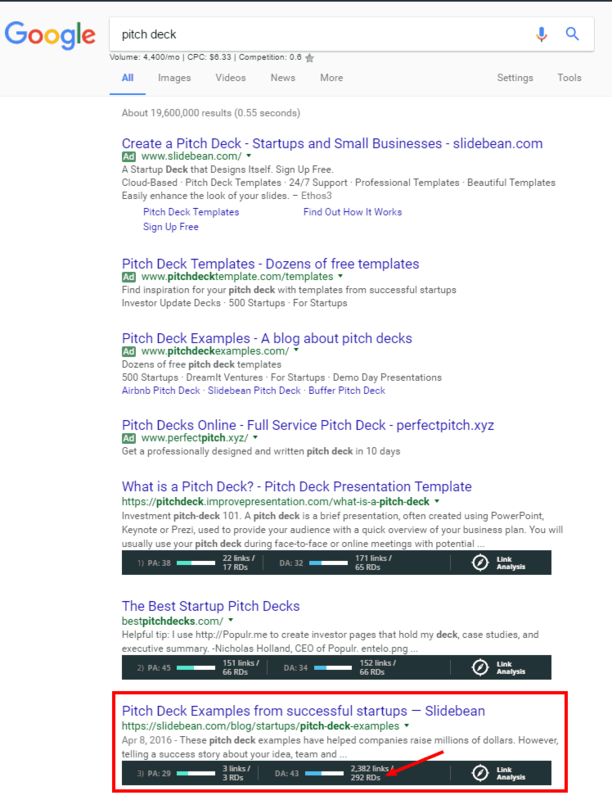 They knew that they had a great product for startups looking to create pitch decks and that this was a hot term–almost 5,000 monthly searches. Plus, the traffic was expensive from a PPC standpoint (over $6 per click). They invested in growing their domain authority with an eye on this particular search term. All told, they have built links from nearly 300 unique referring domains and now they rank #3 for this competitive term, which likely brings them close to 1,000 targeted visitors per month. Eventually, they may stop buying PPC ads and instead rely entirely on organic traffic. Some businesses and organizations are more interested in using content as a way to foster and build community than directly sell a product or service. This kind of approach may be slightly different from your typical content marketing strategy in the sense that one of your main goals is to drive engagement within the community and direct action becomes a secondary metric. This type of approach doesn’t rely very heavily on organic search like the others. Instead, it works by creating a core group of users/readers who remain engaged and help generate traffic and engagement through social networks and email marketing. 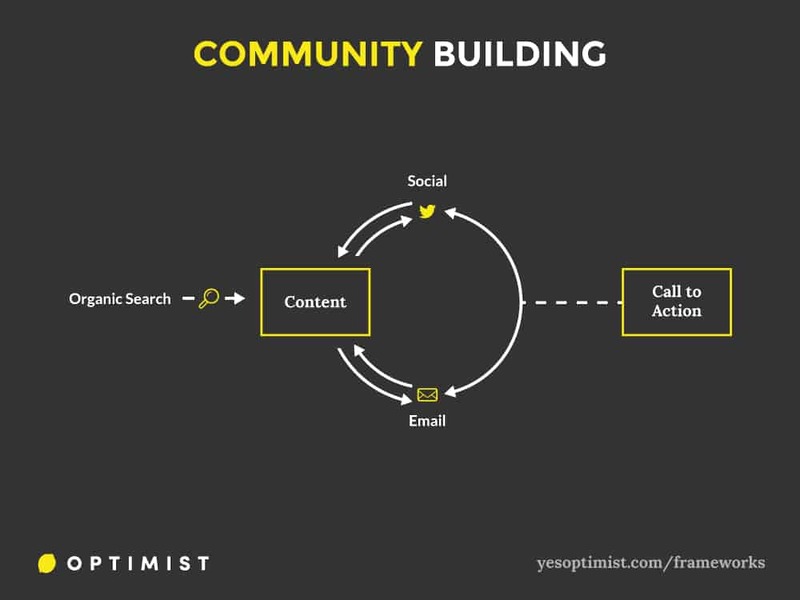 In this scenario, your primary goal is to create engagement, return visitors, and conversation between community members that keeps people coming back and keeps expanding the circle. To accomplish this, you’ll need to engineer content that is specifically designed for engaging your target market through these specific channels. Just like how Buzzfeed has mastered the art of generating engagement through Facebook, your goal should be to create and share content that gets clicks, likes, shares, and generates conversation within your target market. The blender company Blendtec is one of the most popular case studies in all of content marketing. Over the past several years, their videos series showing them blending various objects–from iPhones to Justin Bieber CD’s–has amassed million and millions of views and shares. They’ve become a nearly household name on the strength of their viral videos alone. But, one of the things you’ll notice right away about their approach is that they don’t rely on many of the traditional best practices for content marketing. They’re not pushing a sales message or capturing leads or doing a lot of the stuff that’s part of most of these strategies. This is because they’re investing in long-term brand awareness, engagement, and growing their audience. And it has helped them drive huge business results. This is where the community-building strategy is different than many other approaches. It’s about fostering long-term relationships versus short-term business objectives. The primary measurements of success come in the form of engagement and active participation from community members. Business metrics like sales and revenue follow along from there. 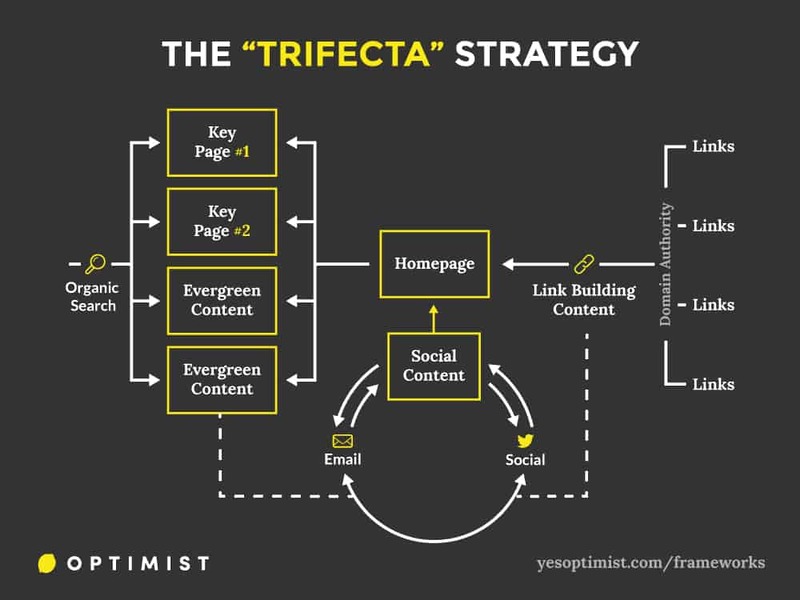 The “Trifecta” strategy that we’ve previously outlined is essentially an all-cylinders content marketing approach. This framework focuses on driving short-term traffic and brand awareness through social content while also investing in long-term growth through evergreen and link-building content. For many companies, this is the optimal solution because it can create success for almost any high-level business goal that they’re looking to achieve. But it’s also more difficult to accomplish than other approaches, as it involves many moving pieces. This means either investing more into content marketing to handle all of the various types of content or having a slower build up as each piece starts to generate results. We’ve outlined this approach in much more detail on our case study on growing a startup from 0 to 100,000 organic visits per month. This approach is built on the premise of generating both long- and short-term results. It works by dividing your content into three specific types and using all of them together to generate traffic and brand awareness through social channels and email while also investing in organic search traffic over time. First, you build a large library of evergreen content that’s closely tied to specific keywords relevant to your target audience. Secondly, you use link-building content to elevate the visibility of the evergreen content over time, driving organic traffic. Lastly, you generate short-term results by using social-viral content that drives traffic and engagement through social and traditional distribution channels. Each of these components on their own serves a specific tactical purpose. But together they represent a complete strategy for growing a website through content marketing, SEO, and social media. 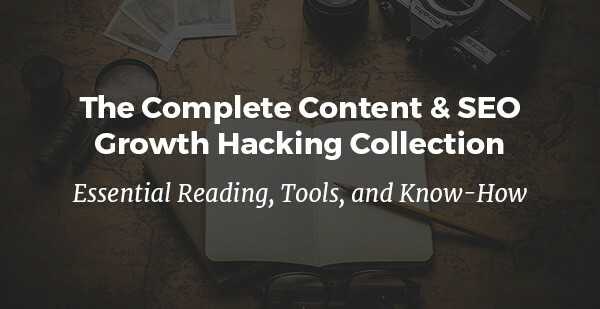 For more on this strategy, get The Complete Content & SEO Growth Hacking Collection: Essential Reading, Tools, and Know-How	. NerdWallet is one of the largest consumer finance websites in the world. Their business is primarily built on generating affiliate revenue for helping people find credit cards, auto loans, mortgages, and other financial instruments. This means that their most valuable pages for generating money are primarily their rankings like “Best Credit Cards”–pages where high-intent consumers land from organic search and are most likely to click through looking for a credit card. But this is only part of their strategy. They also invest in driving short-term traffic and brand awareness through social channels by touching on new and interesting stories, listicles, and other kinds of social content. And they use other types of content to build links to their domain. One of their most-linked pages is their series on the average household debt in the U.S. While this is an interesting and newsworthy report, you can probably imagine that the traffic that lands on this page is probably not as likely to convert as those specifically looking for a credit card. Even so, the links they generate with this report–some 1,000 referring domains–have helped bolster their entire site. This has helped them rank better for their high-intent search terms. Frameworks help us understand the world. When it comes to thinking strategically and applying insights to steer creative execution, using a framework is like having a blueprint. It shows you how the pieces fit together. But it doesn’t tell you what color the carpet should be. These content marketing frameworks are like blueprints. Each of one represents a different strategy, approach, and plan for executing content marketing. Many of them share characteristics or apply similar principles to achieve different goals. But they don’t tell you anything about the specific content you should create or any the other executional details. While a lot of people talk about “best practices” or write case studies about what worked for one company or organization, the reality is that content marketing is not one size fits all. Content marketing for an ecommerce company looks different from a SaaS startup looks different from a nonprofit agency. The goals change, which means the strategy and the tactics also change. That’s before even considering the difference in the actual content that you’re creating for each different company in different industries. But, what remains the same are the fundamental ways in which content is used to achieve specific goals–the blueprints are all built on a common playbook. And that’s what these frameworks are all about. The key to success is to understand the specific needs and goals of the business and then put together a custom-built strategy based on those goals and rooted in sound principles of effective content marketing. Use these frameworks as an outline for your strategy–a blueprint for how to create value–and then customize them to meet the needs of your business. Nice article Tyler and good work on the graphics. I enjoy reading your stuff. Keep it up. Dig the breakdown. I’ve been putting a lot of thought into content creation frameworks as well – always refreshing to see other perspectives on how to go about it. Great Article Tyler. What tool do you use to create those diagrams in the article? Great & valuable read ! i have just found your blog today and i have to say you have created remarkable content ! Would you have examples of content for the following objectives: awareness > interest > decision > action ?